(Camden, NJ) – The Freeholder Board, City of Camden and Cooper’s Ferry Partnership are working together to renovate and recreate 4th and Washington Park. A complete revitalization of the public park began this week and will be finalized in the spring. This approximately $1.4 million project includes a new and expanded playground and sprayground, fitness equipment, reconstructed basketball and handball courts with sports lighting, a graded lawn for sports practices and active recreation, a walking loop, new fencing around the entire park, a new pavilion with seating, lighting, picnic tables, benches, and landscaping. 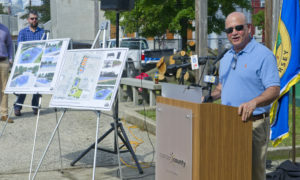 Mayor Frank Moran talked about the importance of the project and the partnership with the county and neighborhood to bring this renovation to fruition. The project is also supported by a $100,000 contribution by Jaws Youth Playbook, the foundation of former Eagles quarterback Ron Jaworski, for the renovation of the playground. Jaworski has been a key stakeholder for creating safe, healthy places for kids to play and supports the Camden Health & Athletic Association. 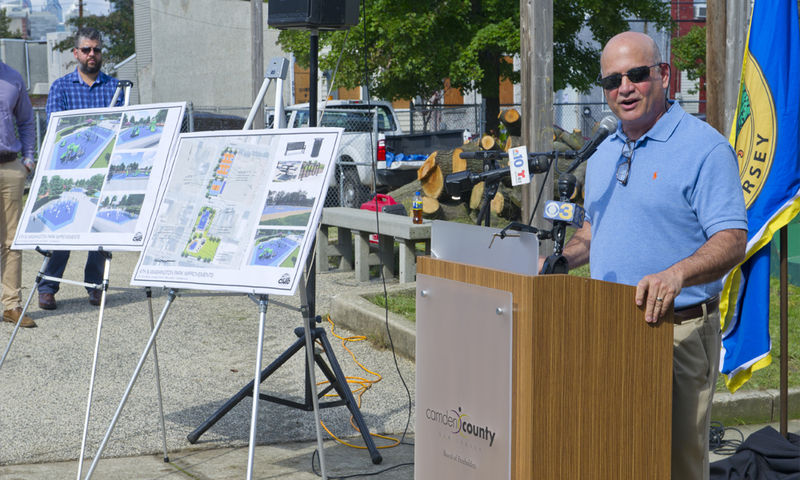 4th and Washington Park is the second of four County-funded park improvement projects in the City of Camden to move into construction. Last month, the county successfully opened the first of these projects at Alberta Woods Park. Nash continued about the need for community input on park and open space renovations from members of the neighborhood.